The Reservoir is an online place to share your documents and media, and access it from anywhere. But it is much more! Based on our frameworks for cross-realm authentication, you can control access by others. So your sports team can submit videos, your collegues can share documents, and your spouse can review your Calendar and extend your ToDo list. The intent of the Reservoir architecture is to enable online document handling, both for personal use and for sharing, in a structured, straightforward manner. Bring your own uptime, and let others do the same... thanks to queued delivery. Contact Management is where you handle your contacts' phone calls and messaging and so on (Communication), where you grant people access to upload and download content (Access Control) and where you can keep an internal dossier on each (Relation Tracking). Scheduling & Updates is concerned with aspects that change over time; tasks that you need to do or have done (ToDo lists), your schedule and its integration with those of others (Calendar), and developments of distributed processes such as an online order (Process Tracking). 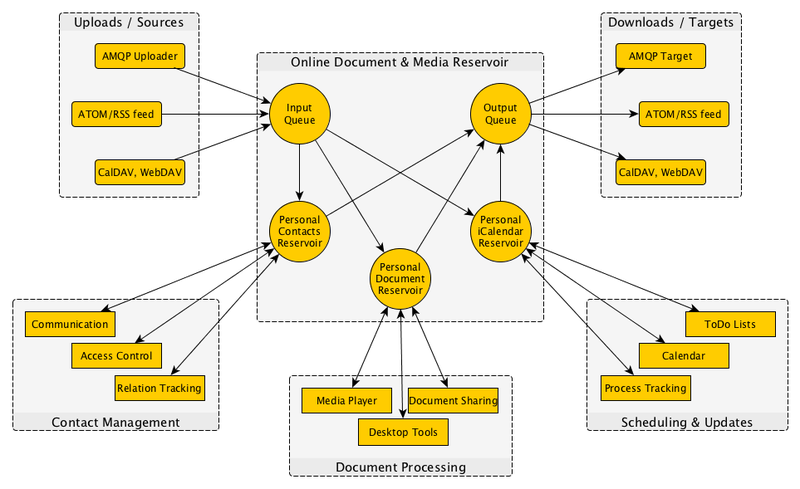 Document Processing is concerned with editing, co-operating and so on, on data sets that you may hold privately, or share with others; we show interesting video and audio shipped to you (Media Player), text processing, spreadsheets, databases (Document Sharing) and all sorts of other data (Desktop Tools).  AMQP Uploaders and Targets represents a protocol to push MIME-typed data between online players. The remote parties bring their own authentication mechanisms, and as many as possible will be accepted. Restrictions may be made as to the kind of data shared. ATOM/RSS feeds are the classical model of sharing documents, usually pulled from the recipient. Subscriptions may reverse the order. CalDAV en WebDAV are HTTP-based access methods, we could also mention REST-based systems (such as krsd) and so on, and perhaps zoom in on Calendars. Incoming queues enable receiving things and processing them as soon as the system is ready for accepting the new input. What has been accepted in the input queue are considered new documents, and asks for attention. Outgoing queues make it possible to keep trying delivery for some time, possibly running over a number of protocols, until a submission is accepted. It is possible to keep things here for a prolonged time, effectively publishing it for any period desired, and this may be access controlled to be a private communication, visible to a given community or to be totally public. The internal Reservoirs are more or less dynamically constructed views on the data that has been accepted from the incoming queue, or that has been uploaded by the user. In fact, documents may be shared with others under the same domain or realm.